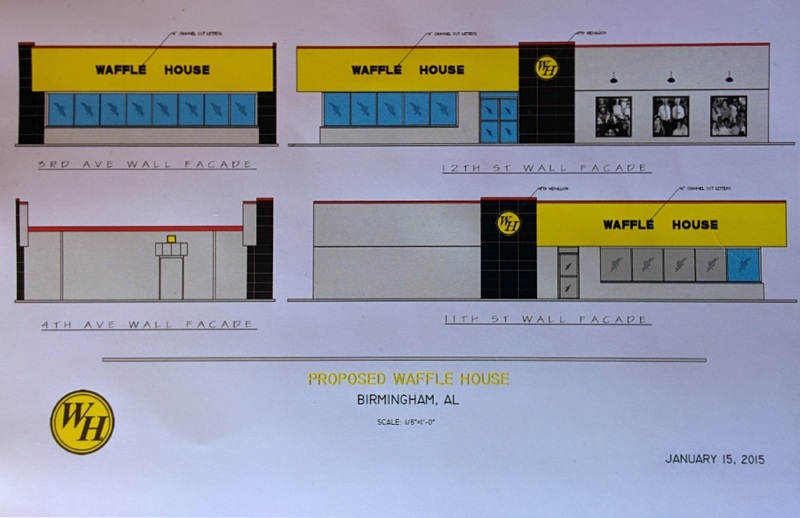 Birmingham’s Design Review Committee heard a signage case during Wednesday morning’s regularly scheduled meeting that sets the stage for a Waffle House location on the edge of the city’s central business district. It would be the third location in the greater downtown area — all opening in the last 3+ years. There was no timetable given by the applicant for when the new location will open, though the proposal includes a refinishing of the facade. It will be the first one with direct access to Interstate I-65 since the location adjacent to the Medical Center Inn was demolished shortly after the purchase of the property by UAB in late 2011 to use as intramural fields. The building in question, located at 1104 3rd Avenue North, has seen several restaurants in recent years. It also sits at the foot of one of the busiest off-ramps for Interstate 65 northbound into the downtown area. Its most prominent usage during that time period though would be that of campaign headquarters for former Birmingham mayor Larry Langford during his successful 2007 run for office (as this photo of Langford in front of the building by Bob Farley shows from that evening). Photo: Rendering courtesy of applicant. @bhamterminal it's a great word. I'm poised to dine in a Waffle House in the near future. @jbagby25 it suddenly makes it even more fun than it would've been otherwise, doesn't it? @bhamterminal I'm poised to order chili on my hash browns. It makes it better. @jbagby25 some folks are more excited than others. We would've used positioned, but then some would've said we weren't excited. @jbagby25 we've also learned to never say it's done until the ribbon cutting happens.